Jambrains is like a Kinder Surprise: you never know exactly what you are going to get but you know beforehand that it’s going to be tasty and nicely packaged, a forge of strong melodies and the power of guitars en masse and with just a pinch of folk thrown in for good measure. 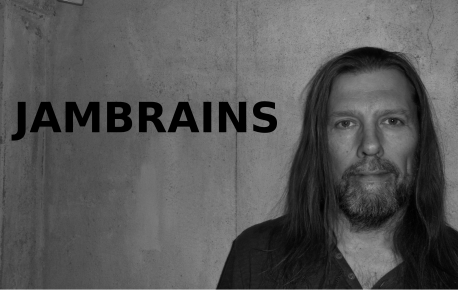 Being a one-man-band means Jambrains is a pure studio projects, so no live gigs I’m afraid even though I’ve been in my fair share of bands over the years. All songs are original and arranged, recorded and mixed by Jambrains in studio WaterLilly. From time to time songs will also be co-written with other talented writers and every now and then they may alos appear as special guests on a track. Weapons of choice includes a bunch of Ibanez guitars (including one with transplanted Line6 Variax electronics) , a Peavey Cirrus BXP 5 stringed bass, Cubase 8 Pro, Steinberg Houston, JamStix, Steven Slate Drums, EZKeys and assorted Waves and IK Multimedia plugs.